TygerClaw's innovative and stylish wall mounted desk is perfect and suited for any home office, den, living room, kitchen or entryway. The Stable work surface is perfect for your computer or simply as a place to get your work done. The side compartments and top shelf provide functional storage and visual appeal. Installation is a breeze with TygerClaw's innovative metal hanging rail system proudly manufactured in North America using CARB-compliant, laminated composite wood. Ships Ready to Assemble, includes an instruction booklet for easy assembly. 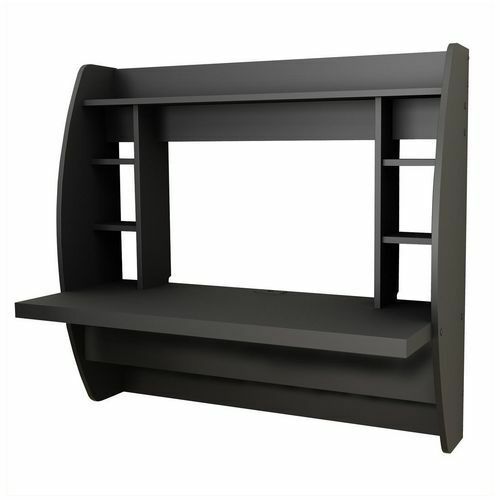 Stylish wall mounted desk - Black TygerClaw's innovative and stylish wall mounted desk is perfect and suited for any home office, den, living room, kitchen or entryway. The Stable work surface is perfect for your computer or simply as a place to get your work done. The side compartments and top shelf provide functional storage and visual appeal. Installation is a breeze with TygerClaw's innovative metal hanging rail system proudly manufactured in North America using CARB-compliant, laminated composite wood. Ships Ready to Assemble, includes an instruction booklet for easy assembly.